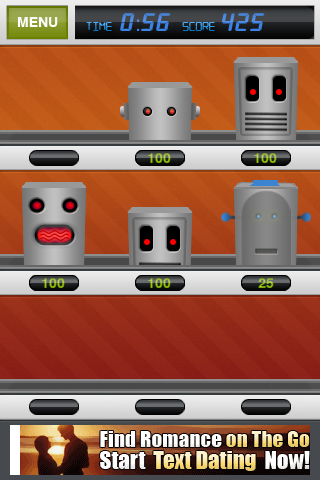 Today we have an arcade style “whack-a-mole” iPhone game but instead of moles, we have robots and a few other twists. 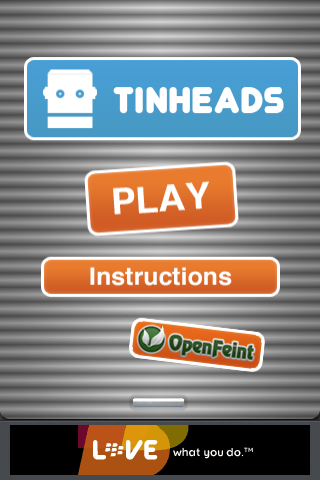 TinHeads is a very, very high paced arcade classic that is similar to “Whack-a-Mole”. While the characters of the game are different, the game play mechanic is the same. 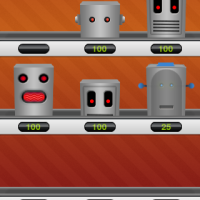 The game tests player reactions during a 60 second game play session in which players must tap on as many robot heads (TinHeads) as possible. Each robot has a specific point amount, so strategically choosing which robots to tap becomes a key factor in maximizing the score within 60 seconds. If players take too long to tap on a robot, the robot head disappears almost as fast as it appears. Along the way players can tap on brief time bonuses to add to the clock but players must be cautious as to what they are tapping. Occassionally a human face will appear and tapping that will deduct 50 points! Moreover, there are robots called “BombBots”, which players have five seconds to destroy before they explode. 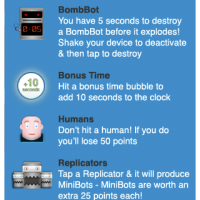 To deactivate a BombBot, players must shake their device to disarm the bomb and then tap on it to destroy it. Failing to do so results in an explosion and the end of the round. Needless to say, among the tapping chaos, BombBots are the most difficult character to keep track of. 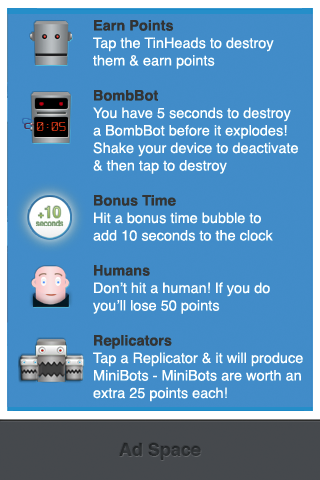 Players can also earn extra points by tapping on a “Replicator” robot who then spits out “MiniBots” each worth 25 points. 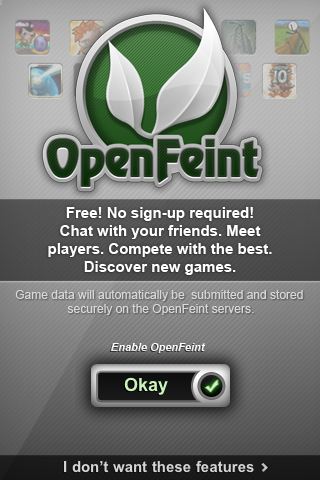 For multiplayer, TinHeads makes use of OpenFeint integration so players can keep track of scores and compete against friends online. The one thing I really like about this game, aside from the chaos, is that every round of TinHeads is different. The game play is unpredictable and players do not know where the next TinHead will appear. 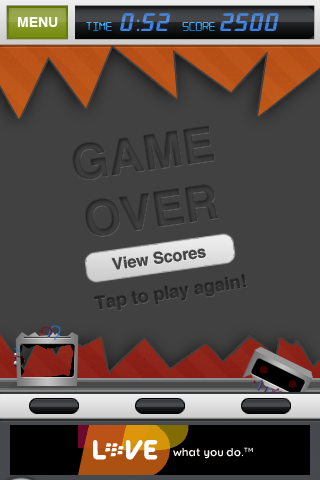 Controls are nice and simple using single tap gestures to eliminate robot heads and gain points. 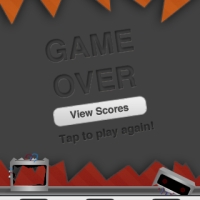 But due to the pace of the game, I usually find my taps losing control as everything is so so fast! Navigation of the app is the most simplest I have ever seen. The game starts up and players have three buttons to choose: TinHeads, Play, and Instructions. The former two start the game. 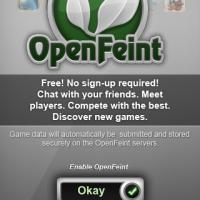 Also to note, the app is ad-supported with a single unobtrusive advertisement bar located at the bottom of the screen. Visuals are rather plain but considering the context of the game, it looks okay. The MiniBot animations are fun as they run around the play area sporadically. Sounds are available for everything, whether tapping on the robot heads or experiencing an explosive BombBot. The game also supports iPod music so players can customize their listening experience. TinHeads is scored a 5 out of 5. 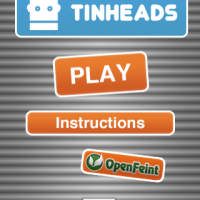 TinHeads is available on the iTunes App Store for free! Google Goggles Headed For iPhone?